ABOUT THIS INTERVIEW: On November 12th 1963, an interview with the Beatles was filmed for the Southern Television program 'Day By Day.' This chat took place backstage before a performance that, in the end, would be cancelled. Ringo Starr is wearing a scarf around his neck and sounds as if he has a sore throat. Meanwhile, Paul McCartney looks at times very uncomfortable and speaks only minimally. As it turned out, Paul fell ill with stomach flu before their scheduled performance, and the show at Guildhall in Portsmouth would be cancelled and rescheduled. In this brief interview, Jeremy James asks the Beatles about their music, and also about their Royal Variety Show performance which had taken place just one week earlier. Q: "Are you beginning to find the strain of this going around the country at this tremendous speed getting you down a bit?" JOHN: (giggling) "No, we like it. It's great." Q: "You don't find it frightening, this business of being mobbed and having to go through all these rigamaroles to get here?" JOHN: "No. The police get mobbed, we don't." 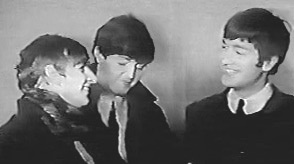 PAUL: "It's always well organized, you know. Tonight was very good." Q: "How did you get here tonight?" Q: "You're getting so much publicity these days, and even the 'egghead' papers are writing about you. Have you been just a little bit worried that you might be going over the top fairly soon?" JOHN: "No, you know. When you gotta go, you gotta go." Q: "What are you going to do when your time comes?" GEORGE: "Sail on me yacht." RINGO: "We don't know. We haven't got any definite ideas what we're all gonna do." JOHN: (gesturing to Ringo's scarf) "Been to college, have you?" RINGO: "Yeah, it's me school scarf. Borstal High." Q: (to Ringo, referring to the reason for the scarf) A touch of throat?" RINGO: "Yeah. (coughs, then continues jokingly) There's nothing wrong with it!!" RINGO: "I always talk like this." Q: "You're not thinking of giving up the Big Beat stuff and going in for some harmony singing? Because one or two people said you're very good harmony singers." JOHN: "Well, we do it, you know. There's harmony in the big beat. It just happens to have a beat as well. All of our records have had some kind of harmony on them." Q: "I noticed in the Royal show that you did one ballad number. Is this something you're going to do more of?" JOHN: "We've been singing it for about five years, and we've always done numbers like that. It's just that we're known for faster numbers." Q: "Do you like the ballads?" JOHN: "If they're good. You know, there's good ballads and good beats." Q: "How did you enjoy the Royal Variety show?" GEORGE: "It was great. Fabulous. It was very good, you know. The audience was much better than we expected."